There are a few natural responses that may occur when someone you just met is wrapping you from head to toe in a space blanket–like material. You might have the urge to scream for help, or at least question all of your life decisions leading up to this point. You mostly likely won’t take a deep breath and close your eyes, willing yourself to relax and enjoy the process—that is, unless you’re getting a body wrap. A slimming and supposedly detoxifying spa treatment, this under-the-radar practice has been used by celebs and average women for ages to slim down and tighten up before big events. Body wrappers like Gwyneth Paltrow and Victoria Beckham tout a multitude of beauty benefits, from reduced sun damage and keratosis pilaris to smoother, tighter skin. Curious, I stopped by Arcona Studios in Santa Monica for one of its famed body wraps, a 50-minute treatment that is supposed to “cleanse, detoxify, disperse fatty acids, and restore elasticity.” All things that I want in my life—and if I had to be wrapped up like a newborn babe and left alone in a dark room for almost an hour to achieve it, then so be it. Keep scrolling to read about my experience! And wrap me up she did, like a giant, somewhat squeamish burrito. The body wrap was heated and tight, and I couldn’t help but feel just the slightest bit claustrophobic, lying helpless on the table with my arms pinned to my side. Luckily, Antonia chose this moment to give me a head massage, which was immensely soothing and managed to banish any spider-prey associations I might make. She left me alone for a few minutes (I lost track of how long—10, 20? ), during which I closed my eyes and tried to tell myself that if Gwyneth could do this, then so could I. The soft, classical music had almost lulled me to sleep when Antonia returned, here to unwrap me and apply another body mask. This one was super cooling and left me a bit chilled—she explained it was another treatment used to “further promote detoxification.” She laid a few warm towels on me to further infuse the skin-brightening mask into my skin, then instructed me to shower off the rest after a few minutes. At the end, Antonia came back and lotioned me up (at this point, I felt vaguely like a piece of poultry, albeit a lovingly cared-for piece of poultry, getting rubbed up with various herbs), and instructed me to drink more water than I normally would throughout the rest of the day to aid the detoxification process. Afterward, I certainly felt lighter and less bloated. The skin on my body, which is usually perpetually dry, felt the softest it’s felt for a long time, and had a glow my usual hurried lotion routine doesn’t produce. However, I wanted to know exactly what was going on underneath the surface. To do so, I caught up with Allison Marks, Arcona Studios spa director, esthetician and skincare expert, and asked her all my pressing questions. Keep scrolling to find out everything you need to know about body wraps. First things first—where did this somewhat strange spa procedure originate? Cleopatra, possibly. “Body wraps have been performed for centuries, originating in ancient Egypt, for their healing and soothing effects, which enhance the skin appearance and texture,” Marks says. As for the detoxing part, she explains, the heat assists with your body’s natural detoxification process (I remember Antonia telling me during my treatment that raising your body temperature with a body wrap sets off the same signals in your body that a fever would, which results in a similar detoxification response). It should be noted that some dermatologists have said there’s no solid evidence that body wraps can help “detox” beyond a surface level (i.e., clearing out your pores). Derms agree that body wraps can temporarily help you tone up and aid in the appearance of tightness, but they shouldn’t take the place of healthy diet and exercise. Marks says you can expect the toning results to last about 48 to 72 hours: “We recommend maintaining results at home with our Pumpkin Body Lotion ($35) and Fruit Enzyme Body Scrub ($29).” Is there anyone who should avoid body wraps? Marks says you should probably pass if you are pregnant, claustrophobic, or allergic to any common ingredients used during the treatment, such as seaweed, algae, and retinol. 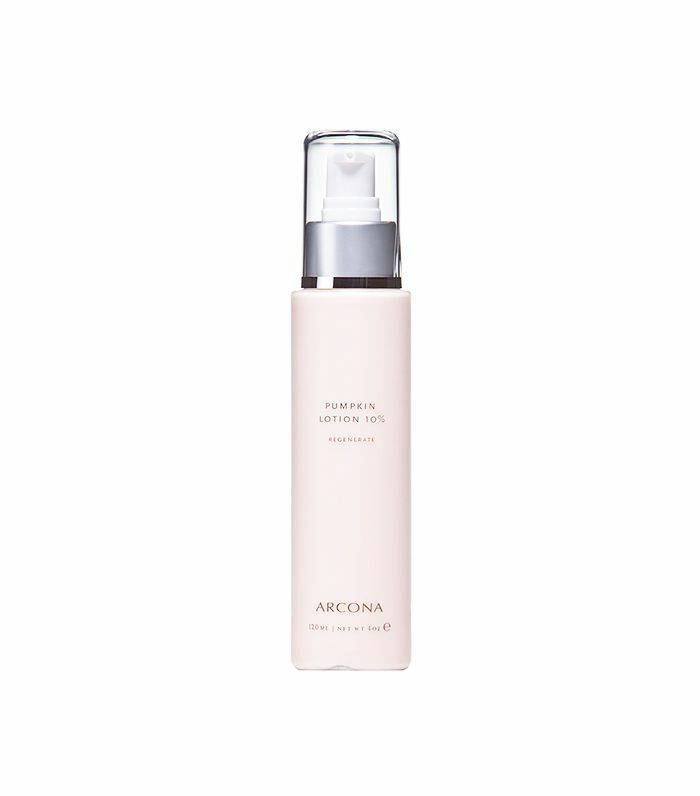 Shop Arcona's Pumpkin Body Lotion below and tell us—would you ever try a body wrap?